The Travel Trailer is the most common RV and comes in a range of styles to suit a different lifestlyes. These compact homes can be towed by a car, SUV or pick-up truck and hauled all over the country. RV travel trailers come in endless sizes and many feature garages, roof top patios, bay windows, fireplaces, offices, hideaway beds, expanding sides, and lowering roofs. If you can dream it, chances are someone has already built a travel trailer to suit your needs. The travel trailer is the most popular RV type. With a wide array of floorplans, sizes and features, this is a flexible RV for the both the weekend warrior and long term traveller. The best part, you can use most vehicles to tow this trailer making it easy to travel from A to B. Smaller models can be towed by mid-size vehicles including your family car, SUV or pickup truck. Check with your dealer for your vehicle's tow limits. Larger models must be towed by heavy-duty vehicles but do not require a special highway movement permit. Detachable from tow vehicle so you can leave your trailer at the park and use your car or truck for shopping and sightseeing. All the conveniences of home including amenities for sleeping, showering, dining, cooking and entertainment facilities. You can extend the RV slide-out wall outward at the touch of a button, up to 1.07 metres to create larger living or sleeping areas. Lightweight versions or on the market, designed specifically for towing behind most 6-cylinder family vehicles. 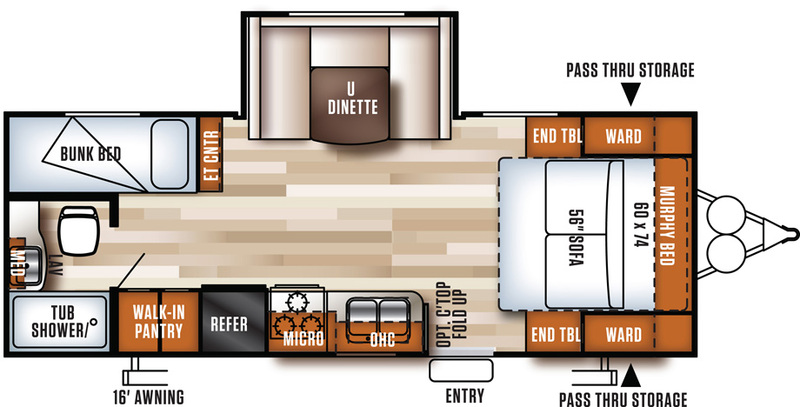 With plenty of options available for the floor-plan of the travel trailer, most layouts contain the comforts of home and many include family-friendly bunk rooms. You can easily find units suitable to your travel style and accommodation needs.